and heat recovery (HR) to transfer heat and/or moisture from the exhausted air to the ventilation (or makeup) air. All of these technologies are available off-the-shelf, but their utility depends on the combination of them present, the balance of driving building physics forces—which in turn depends on building type, age, construction, climate, and season—and the aptness of the control sequence. This project seeks to understand these effects, estimate IAQ and energy benefits, and provide clear guidance for combining and controlling ventilation-related technologies, with a focus on cost-effective retrofits in existing commercial buildings. This parametric modeling study begins with the US DOE’s Commercial Reference Buildings EnergyPlus models and modifies them to incorporate all combinations of the four technologies. Office and educational buildings with multiple system types, vintages, and sizes are included. The project will clarify which building parameters affect performance, identify integrated technology packages that provide the best results for each building group, quantify their IAQ and energy benefits, and recommend control sequences for their operation. The aim is to promote an integrated approach not only to technology and control, but also to IAQ and energy considerations, which results show need not be at cross-purposes. Different combinations of readily available HVAC technologies can help save energy, increase ventilation, or provide both benefits, but their interaction effects can be complex. 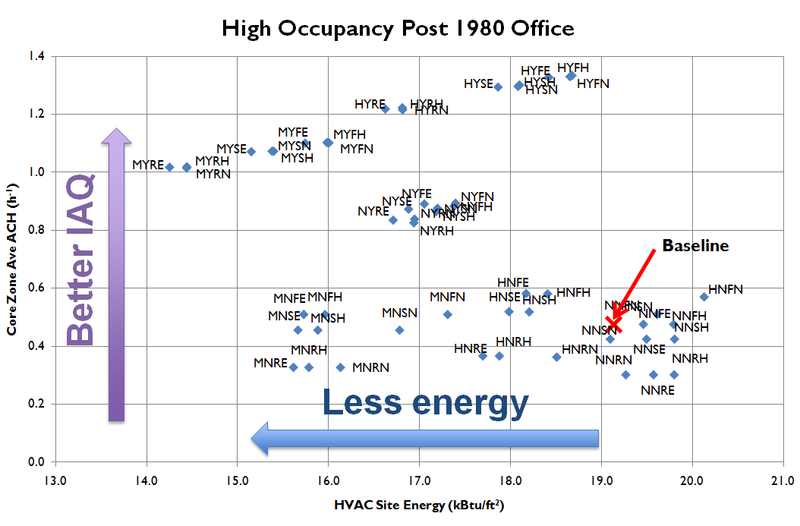 Simultaneously plotting the energy and IAQ performance of each combination (each point on this scatter plot) helps identify strategies that improve both objectives.